Laverna Maxine Sims, age 87, passed away April 12, 2018 at The Oaks in Mena, Arkansas. Maxine was born on April 27, 1930 in the Mt Clair Community (between Cove and Vandervoort) to the late Mack and Delia (Price) Towry. 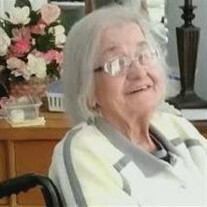 She was united in marriage on April 2, 1949 to Elgin Sims in Mena. This union was blessed with a daughter, Elaine. She attended the rural Mt Clair School and graduated from Vandervoort High School. After graduation Maxine attended Southeastern State College at Durant, Oklahoma where she met Elgin. She taught her first school at Cove Elementary in the late 1940’s. In the early 1950’s she taught in Illinois in a one-room elementary school, teaching 8 grades. Maxine was preceded in death by her parents, husband, daughter, brothers-in-law William Pate and Eli Sims and siblings, Mary Jean Pate and Delano Towery. She is survived by a sister and her husband, Linda and Corky Miller, and sisters-in-law Ila Jean Sims and Diana Patterson. Also, numerous nieces, nephews, great and great-great nieces and nephews where she was fondly known as “Aunt Dobbie”. Maxine is also survived by her many friends and staff at The Oaks and the Directors, Lisa and Tim. Mrs. Sims was sent for cremation under the direction of the Beasley Wood Funeral Home of Mena. A memorial service will be held at a later date under the direction of the Beasley Wood Funeral Home of Mena.